Although each event is a bit different, there are some common themes when it comes to providing solid event photography coverage. It’s not just about the candids or the “grip and grins.” Yes, those are part of it, but I enjoy bringing a bit of a creative eye to telling more of the entire story. Details. Wide angles. Shots from down low. Shots from up high. Another belated blog post here but I wanted to share some event photography at Portland’s CENTRL Office, in this case for the Write the Docs conference last year. CENTRL Office has an open, airy environment that works well for large group events. With a large open event space and also some breakout room areas, when I do event photos in a space such as CENTRL Office I look to capture the attendees in the space in a variety of situations. There might be a group meeting, there might be a lecture going on, or as we see with this event at CENTRL Office, there might be folks using laptops to get work accomplished. 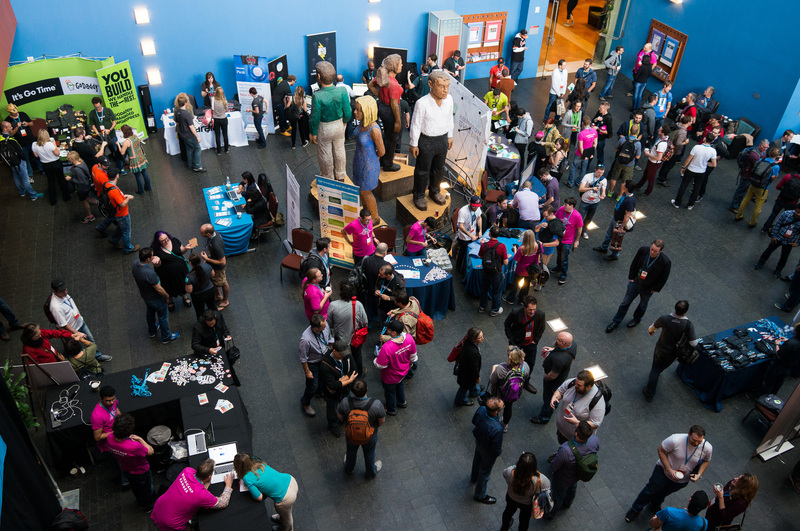 In the event photos at CENTRL Office, we see that it’s a bit more of an informal space than some others (contrast this with event photography at the Oregon Convention Center), but it still allows for a great environment or a conference or other event. With most events, and in most of my event photos, I capture a mixture of pictures that show the overall event – room shots – environmental images that give you a feel for things, along with some images focused more closely on individual attendees or speakers. In the case of these images, there were no formal speakers as this day was all about working sessions and group discussions. My next blog article will cover the other venue for this particular event; you’ll see some examples of Crystal Ballroom event photography. As I catch up on my photography blogging, I wanted to share some images of some Portland event photography from 2016 for a repeat client. I again photographed Comcast Cares Day, a corporate day of service where thousands of Comcast employees take part in various community service events in their areas. This year allowed me to make location photography in Portland and Beaverton as employees performed a variety of tasks around a school in a low-income neighborhood, created quilts for those in need, and planted numerous trees in a greenspace near a creek. As I make the corporate event photographs, I’m working with a bit of guidance from my client as to the highlights they want captured in the images, as well as the messaging they want to convey. After I’m briefed, I take a more photojournalistic approach as I explore the job sites, preferring to make candid images as folks work instead of posed, static photographs. With an event of this magnitude (they perform work at a lot of sites in the area – I generally am assigned to cover three of them) they have volunteer employees take photos as well throughout the day. But they also hire pro photographers, such as myself, to handle the flagship sites and to ensure that they get the most important images. Sure, cameras have gotten better and you can probably have someone volunteer to take photos, and they’ll get some good shots. But if you want all the shots, and you want the most important shots, reliably, you’ll hire a pro photographer who will have the knowledge, experience, and equipment to deliver the results. In conjunction with the NIEA conference I photographed in Portland, there was a Native American Pow Wow held where both local and visiting native people were able to dance, sing, drum, and tell stories together in a pow wow setting. I wasn’t 100% sure what to expect for my first pow wow photography venture, but I wasn’t disappointed. I’ve been to a few pow wows in the past; this was my first experience doing pow wow photography and it was interesting to move around and capture different angles as the dancers moved into and around the venue. The focus of the pow wow, and the focus of my photographs was on the dancers, and specifically on the colorful regalia worn by the native dancers. The dancers spanned several generations; from young children to elders all seemed to be having a good time. I’m thankful that my client invited me to photograph this event and I hope to do more of this sort of work again.